Marie Perreault greets every customer with that-first-week at a new job enthusiasm. Still unfamiliar with the café in the CJ Building at Concordia’s Loyola campus, she struggles to find the price of a croissant on her cheat-sheet next to the cash register. “I’m going to a concert tonight with my friend,” said Perreault, anxious to finish her shift. A few months ago, a friend invited Perreault to attend a Muse concert at the Bell Centre. At the time, she had saved enough from her minimum wage jobs to pay for her ticket and decided to go. Perreault works 40 hours a week at $10.55 per hour. She doesn’t receive any tips as Aramark—the food provider hired by the university—doesn’t allow tip jars at their locations on campus. Over the past year, student groups and labour unions affiliated with McGill University have assembled to create the Fifteen and Fair Campaign. It’s modeled after the Fight for $15 campaign that began in New York in 2012 when McDonald’s workers asked their employer to raise the minimum wage. Similarly, the Fifteen and Fair campaign at McGill is demanding that the university institute a $15 minimum wage for all its workers, adjusted to inflation. They’re also asking for workplace practices such as equal access to benefits, health care, parental leave and subsidized transportation, said Molly Swain, president of the Association of McGill University Support Employees. Studies have shown that “$15 is the bare minimum for living wage in Montreal,” according to Swain. However, some, like Christian Sigouin, a Concordia economics professor, don’t agree that raising the minimum wage is a viable business model. Some theorize that raising the minimum wage would lead to higher dropout rates in high school because students would have more incentive to start working right away, he explained. “It’d be counterproductive,” he remarked. The goal is that young students get a higher education and enter the workforce in high positions to reverse the trend, Sigouin said. “Now, the austerity measures have started to chew through the most vulnerable and precarious workers,” she said. The university is replacing staff workers with casual workers, paying them as little as half the salary for the exact same labour and allotting them fewer benefits, she continued. “Part of austerity is to get as much cheap and disposable labour as you can have,” Swain said. Universities much like McGill and Concordia often exist as their own microcosm within the city. As the employer, McGill has the power to raise their minimum wage without having to wait for any laws or regulations from the city, explained Swain. She graduated last year from McGill with an Honours degree in women’s studies and a minor in world religion. Throughout her studies, she relied on her jobs both on and off campus to pay for out-of-province tuition, food and rent. There were times when she had to choose between paying for her rent or buying food, and she often relied on the food bank to get a decent meal. Working at the union, Swain meets people with similar and sometimes even worse stories than her own. Nevertheless, the Fraser Institute’s research deducted that an increase in the minimum wage “translates into a three per cent to six per cent job loss among this group.” The study was focused on young workers between the age of 15 and 24. It’s a common misconception to think that those working minimum wage jobs are students, who live at home with their parents and who are only working for “beer money,” said Swain. In fact, she said that’s one of the arguments McGill continues to use to justify their low wages. However, according to the Institut de la statistique du Québec, 50 per cent of employees working minimum wage are not studying, while 61.8 per cent are 25 and over. That’s the case of Perreault, barista at the CJ Loyola café. She’s a 43-year old single mother and has been bouncing from one minimum wage job to another for the past two years now and she’s struggling to make ends meet. 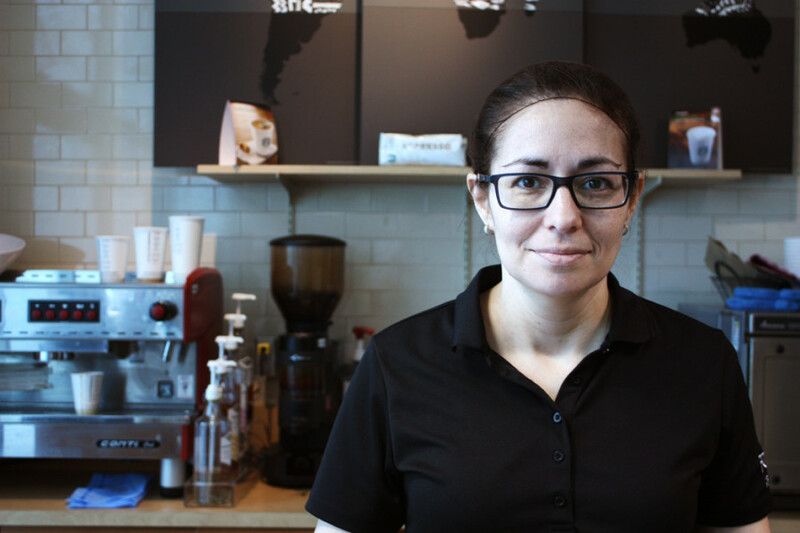 She started working at the café two weeks ago and hasn’t received her first pay cheque yet, but she’s planned out her monthly finance and thinks she will be making just enough money to get by. “The only reason I can afford to live on minimum wage is because I don’t have any debts,” she said. She still lives pay cheque to pay cheque though, providing for herself and her two children, both of whom are subsidized by the government. Before being hired at the café, Perreault was unemployed for a few months. She had just quit her job at The Rail restaurant in Kahnawake, where she was also living. As a Cree First Nations woman working and living on the reserve, she was exempted from paying taxes. However, since Perreault moved into the city, she no longer benefits from this exemption. Perreault and 453,845 people in Montreal, or 24.6 per cent of the population, are living on a low income. According to Statistics Canada, the low-income cut-off is when a family devotes a larger share of its income on necessities—food, shelter and clothing—than the average family. “I’m okay now but I can’t live an extravagant life,” Perreault said.